The GO Home is a prototype for the houses of Belfast Cohousing and Ecovillage. The highly-efficient home is primarily heated with passive solar energy and is a key component of the planned cohousing community, a concept that was begun in Denmark in the 1960s and been in the United States for about 30 years. Audrey Lightner, 14, her mother Denise Pendleton and Alan Gibson are all members of Belfast Cohousing and Ecovillage. The project has been in development for several years and members expect to be able to break ground this summer for the 36 homes. 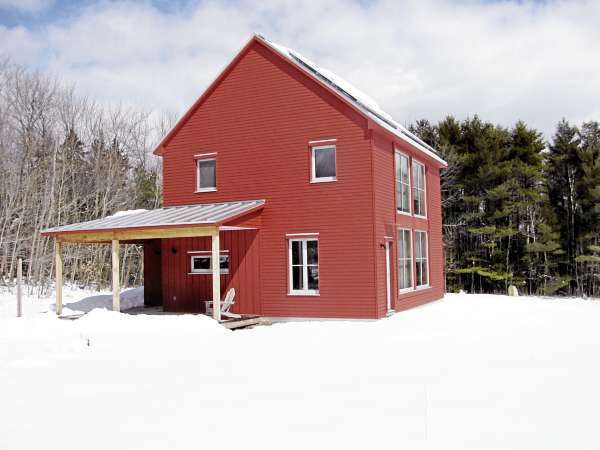 BELFAST, Maine — Life in Belfast Cohousing and Ecovillage, once its residents finally are able to move in, will be lots of things. It will be friendly and sociable, with a planned 36 households joining the intentional community to be built on the 170-acre site of the former Keene Dairy Farm on Edgecomb Road. It will be sustainable, with clustered, smaller housing located on just 6 acres of the property, an on-site farm, and attention paid to preserving the nearby open space and woodlands. And it will certainly be warm. 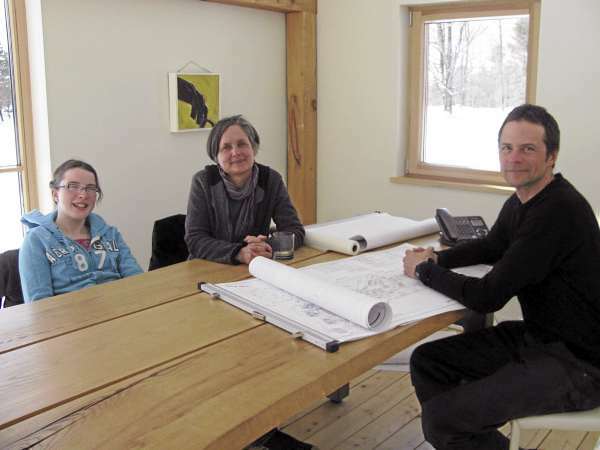 On Saturday, as a foot of heavy spring snow melted outside in the spring sunshine, the temperature inside the ecovillage’s heavily insulated and passively heated prototype GO Home felt much more like summer than early spring as two members sat at a wooden table and talked about the 4-year-old project. That “community stuff” is worth a lot to those interested in a different type of lifestyle, according to ecovillage members, and includes monthly weekends where far-flung members get together to meet, work, plan and play. The greater community is welcome for a family-friendly activity on those weekends, which has included planting a children’s garden, having a horse-plowing workshop, dancing around a Maypole and much more. This coming Sunday, the open house will feature Easter egg decorating with natural dyes, meeting the community, walking the land and touring the extensively insulated GO Home. “Co-housing is an antidote for the isolation that people in their nuclear families experience,” said Alan Gibson. He’s a founding member of the ecovillage and also a partner in the design and building collaborative GO Logic, which built the GO Home. All of the ecovillage’s homes, which will begin to be constructed this summer, will be built along lines similar to the GO Home, with thick blown-in insulation, south-facing, triple-glazed windows to gather sunlight and a very limited need for a traditional heating system. “It’s a different kind of model,” Gibson said. Her family and 22 others have committed to joining the ecovillage, and the community is actively recruiting for the rest of the desired 36. Current members include farmers, doctors, musicians, teachers and more. Equity members have committed to purchasing individual homes in the complex, which is structured like a condominium, and also will cooperatively own the common house and land. They also must invest a minimum of $25,000, while interested or exploring members are asked to purchase a six-month membership for $250. Gibson said the search for members dovetailed with the global financial meltdown, which has posed certain challenges. Although they want to make it as affordable as possible, this kind of housing just isn’t the cheapest, Gibson said. The one- to three-bedroom homes will vary in size from 440 to 1,500 square feet, with preliminary cost estimates ranging from $165,000 to $330,000. One of those people is Stephen Wallace of Alna, an exploring member who said he has essentially committed to signing on. He’s a divorced, single father of a 4-year-old girl, Elisabeth Wallace, and they’ve been coming to open houses at the ecovillage for more than a year. According to Wallace, co-housing is a smart way to live. The energy efficiency of the GO Home doesn’t hurt, either. In Alna, he heats with firewood, which is a lot of work. “I appreciate the energy efficiency of these houses. It just blows me away,” he said. Although the price tag is “definitely high,” he believes it’s worth it. For more information, visit www.mainecohousing.org, or call 338-9200. The next open house will be held 2-4 p.m. Sunday, April 10, at 45 Edgecomb Road in Belfast.